When water service lines freeze, the answer for over 15 years has been the Pulse Jet De-Icer. Both safe and effective, the Pulse Jet De-Icer is currently being used with great success by hundreds of municipalities and plumbing professionals throughout the United States and Canada. 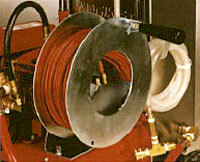 Safe and effective thawing of the frozen water service line - no fire hazard. Completely self contained one person operation. Compact design allows unit to be moved up and down stairs by one person. Constructed for industrial use and designed for ease of operation and maintenance. Flow/Pulse controls allows operator to select between high pulsing (for feed tubing down the line) or maximum flow (for maximum thawing). Reel provides convenient storage for tubing. Probe tip is self-feeding and self-centering to assist in moving tubing down the water line. Probe head recycles water by returning water to reservoir for reuse. Immersion heater to pre-warm water. The Pulse Jet De-Icer provides the most effective safe method for thawing frozen water service lines. Without the fire risk associated with other thawing methods, the Pulse Jet De-Icer can be used on plastic service lines in addition to copper and iron. Built for industrial use, the Pulse Jet De-Icer is designed as a self contained unit utilizing flexible tubing to feed a special spray head down the water line to the frozen section. Once the spray head reaches the frozen section of the water line, high pressure is used to thaw the line. 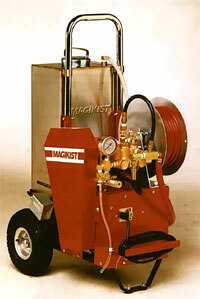 The Pulse Jet De-Icer is fabricated of steel and is powder painted for extra protection. The stainless steel water supply reservoir uses an immersion heater to warm the water. Tubing is conveniently stored on a hand wind reel. The reel can be quickly interchanged with other reels containing larger lengths of tubing. In service for over 15 years, the Pulse Jet De-Icer is currently being used with great success by hundreds of municipalities and plumbing contractors throughout the United States and Canada. Supplied with one reel containing 100 feet of tubing and a second reel containing 200 feet of tubing.